Sixteen brief, readable, but mostly undistinguished essays on writing, American culture, the Far West, and related topics. Stegner is best at close-up appreciations (he does a fine, knowing study of Ansel Adams), weakest at broad-brush literary or sociological theory (forgettable pieces on "The Writer and the Concept of Adulthood," "Excellence and the Pleasure Principle," etc.). Stegner spends much of his time talking about the West as the archetypal American region, a world he's devoted most of his career to. But the spontaneous affection that enlivens these pages often befuddles Stegner's judgment. "The characteristic American relation with the earth persists most strongly in the West," he tells us, not bothering to explain why the rural West (home of James Watt and his following) persists in savaging an environment that other parts of the country would like to see preserved. Stegner's naive faith in regional identity leads him to argue that "A white banker from Atlanta probably has as much in common with a black Georgia sharecropper as he does with another white banker from Salt Lake City or Seattle." Maybe when Stegner was growing up in Montana and Saskatchewan around 1914-1924, but not now. 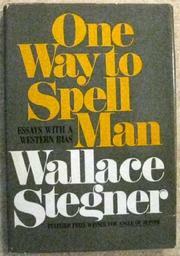 In his uncritical moments Stegner will wax patriotic ("In the process of taming and naming the continent, we produced an economy that was the envy of the world and a political system that despite its clanking has been the model for individual freedom"), only to snap abruptly out of it ("we have spread like ringworm from sea to sea") and sound like a normal guilty liberal. There are flashes of acumen here and there (on Canadian hostility to the US, for example), but otherwise a lackluster show.